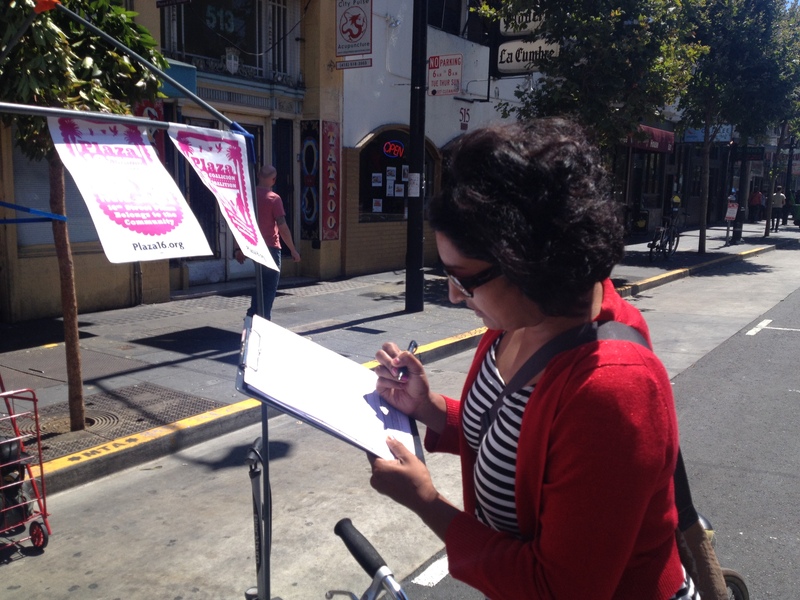 Yesterday was a fantastic day of outreach, flyering, and signature gathering for Plaza 16’s brand new petition at Mission Sunday Streets. We spoke with hundreds of folks from the community and gathered pages of signatures. Based on our many interactions with people, there is clearly deep and wide support within the community for truly affordable housing in the Mission and for stopping Maximus’ proposed luxury development at 16th and Mission. Let us know if you’d like to help with similar outreach efforts in the coming weeks (contact Andy@plaza16.org). You can help gather signatures by printing out a copy of the petition (English/Spanish) and getting your family, friends, neighbors, and coworkers to sign it. Contact Andy@Plaza16.org to turn in the signatures you gather or bring them to an upcoming meeting. And be sure to join us for out next big community meeting this Thursday, 6PM at St John’s Episcopal Church (Julian Street at 15th Street).